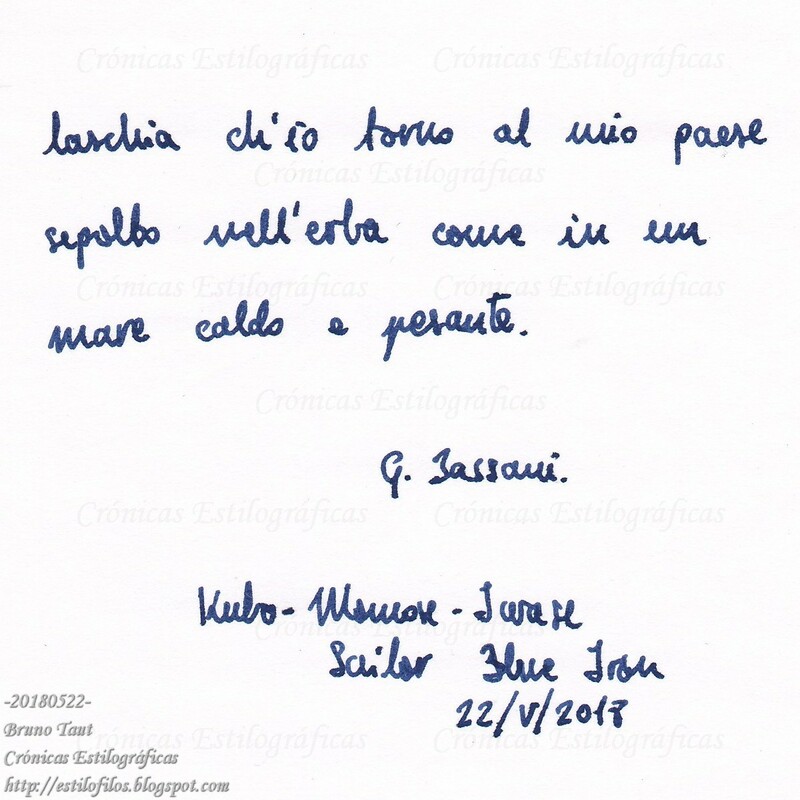 NOTE added on July 23rd, 2018. The body of this pen is not a creation of Mr. Momose, but an old and unused stock of pen bodies of Ishi Shoten's Yotsubishi. The works of Mr. Iwase as a raden artist have already appeared on these Chronicles, and today I wanted to describe more in detail one of his creations. Two are the basic types of canvases Mr. Iwase uses for his works—Pelikan and Montblanc pens on one side, and pens manufactured by old lathe masters and companies long gone lathe master Momose Yasuaki. Today’s pen belongs to the later type. Three elements characterize this pen: the pen body, the nib, and the decoration. Each of them was created by a different craftsman. 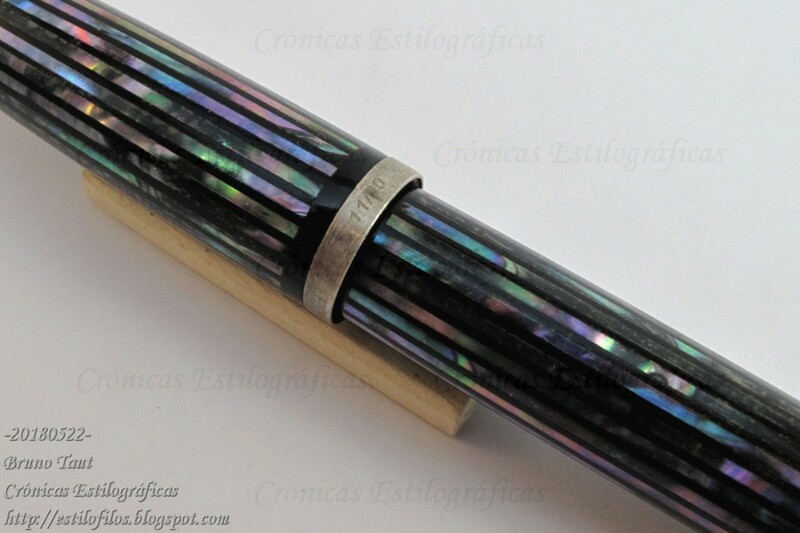 "18 K pen raden / Kubo Kohei fountain pen". 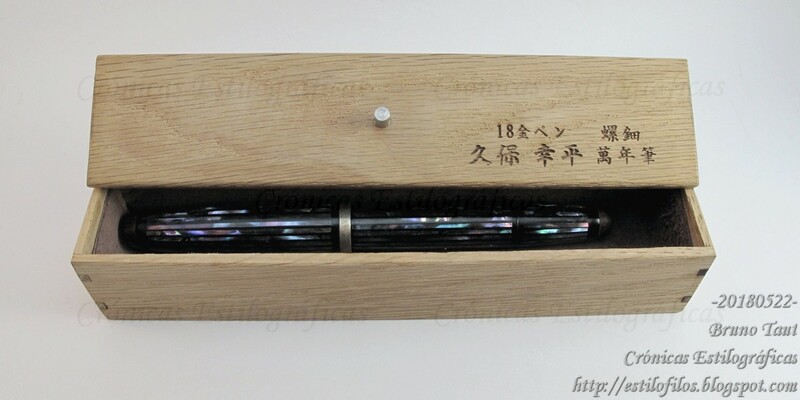 On this case, the basic pen was made by the company Ishi Shoten for its brand Yotsubishi. Its material is ebonite, although the barrel and cap finials are made of wood. 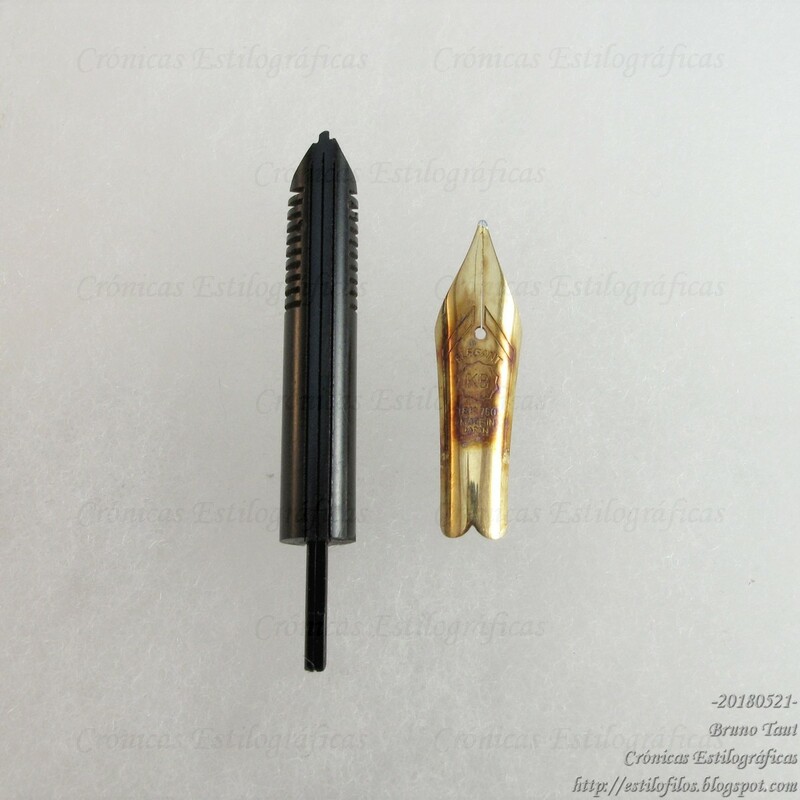 The pen was originally intended as a Japanese eyedropper –the tail can be unscrewed and detached from the barrel--, but the final result is a cartridge-converter pen (Sheaffer type). The cap lip is protected with a silver ring. ... or a cartridge/converter pen. The nib and the feed were provided by nibmeister Kubo. 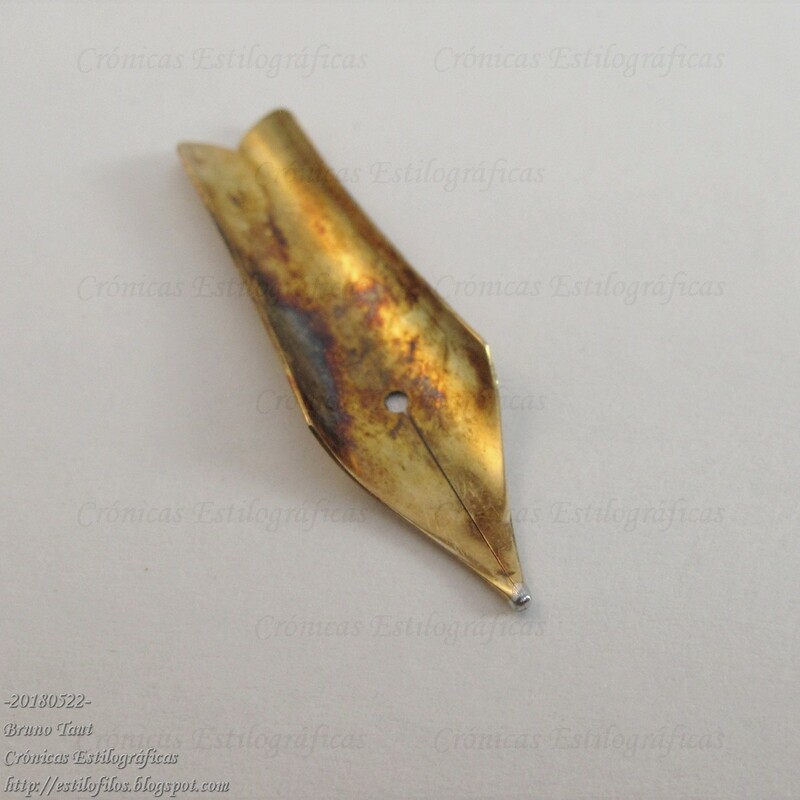 The nib is made of 18 carat gold and is associated to an ebonite feed. 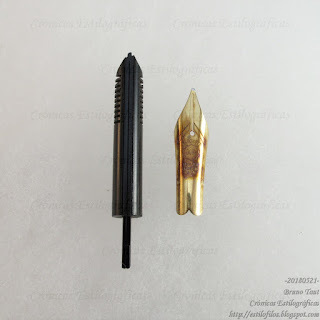 The size of the nib would be comparable to a Bock's #5, or to a Pilot’s 10 (::1::, ::2::) or a Sailor’s “big” size, although the feed's diameter is bigger: 6.5 mm. 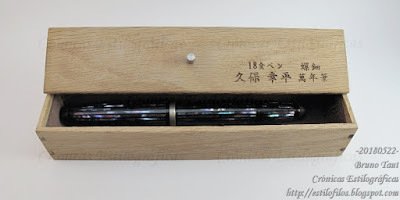 The Kubo Kohei's nib: "ELEGANT / KB / 18K 750 / MADE IN / JAPAN". The feed has three ink channels that provide a rich ink flow. Writing sample with the Kubo-Yotsubishi-Iwase pen. Nothing special on the tip. Just well cut. 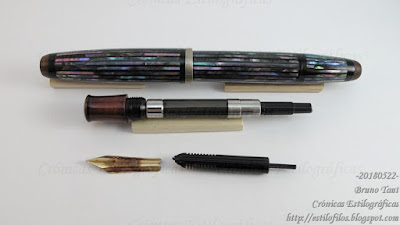 Finally, the decoration is a rich example of the raden technique: carefully cut sea shells glued to the pen body; then, urushi is used to fill up the spaces between the shell stripes and smooth the whole pen. Ad additional later of transparent resin protects the decoration. The gripping section is decorated with red urushi. There is a simple inscription the cap ring: "silver 925 / 11/20". All in all, the pen is an original and attractive work; the final result of two Japanese craftsmen working on old forgotten batches. And in this regard, this is not a unique example, albeit other models are mostly one of a kind. This pen is one of the 20 units Mr Iwase marketed in 2015 and 2016, some of which were sold through the Wagner group. And as it is often the case on artisanal products in Japan, there is no clear sign of the authorship, with the sole exception of the engraving on the nib. However, not many stylophiles (much less occasional buyers) would identify the letters KB as a signature of Mr. Kubo. Interesting post. Thanks again Bruno for showing us this awesome fountainpen. Thank you for passing by and commenting. Thank you for your support.